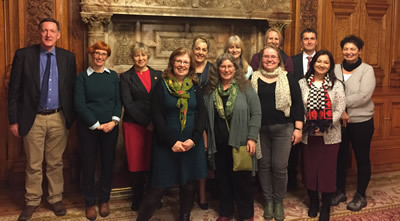 Look who’s talking: Eliciting the voices of children from birth to seven was an international seminar series funded by the University of Strathclyde, Glasgow, Scotland, that brought together researchers and practitioners who work to elicit voice with young children (birth to seven). The intention was to create a space for individuals working in this relatively underdeveloped field to work in a collaborative process, engaging with relevant theory and practice. The aims of the seminars were to move debate forwards, developing guidelines and provocations for practice, and to advance theory to understand the affordances and constraints on the implementation of Article 12 of the UNCRC with young children. The series comprises two seminars of three and a half days each, one in January and one in June 2017. The first focuses predominantly on mapping the field, sharing and discussing experiences and practices and exploring the affordances and constraints of the field. The second synthesises participants’ thinking and identifies the needs and opportunities for development within the field. In both, the commitment was for open dialogue; this was achieved through creating spaces with minimum structure, so as not to curtail or limit conversations. • How do experts understand the concept of ‘voice’ (in terms of Article 12) when working with young children? • What does ‘authentic voice’ mean in relation to children aged seven and under? • Can children aged 7 and under have an informed voice? In what areas (and in what areas might they not have an informed voice) and how is this decision made? • How are current practices (pedagogic and methodological) being used to elicit voice with young children? • What range of specific tools and practices are there that facilitate the elicitation of voices when researching the perspectives of children aged 7 and under? • What are the overarching ethical considerations of eliciting voice?